Finding things to include In a Vase on Monday is a problem on this first day of December. Very few flowers in my garden are real cold winter bloomers; I have to rely on the annuals…pansies and violas…for flowers and then gather foliage to fill in the gaps. Nonetheless, I am pleased to continue to make this weekly offering, with thanks to Cathy at Rambling in the Garden for her initiative in creating this meme, now in its second year. 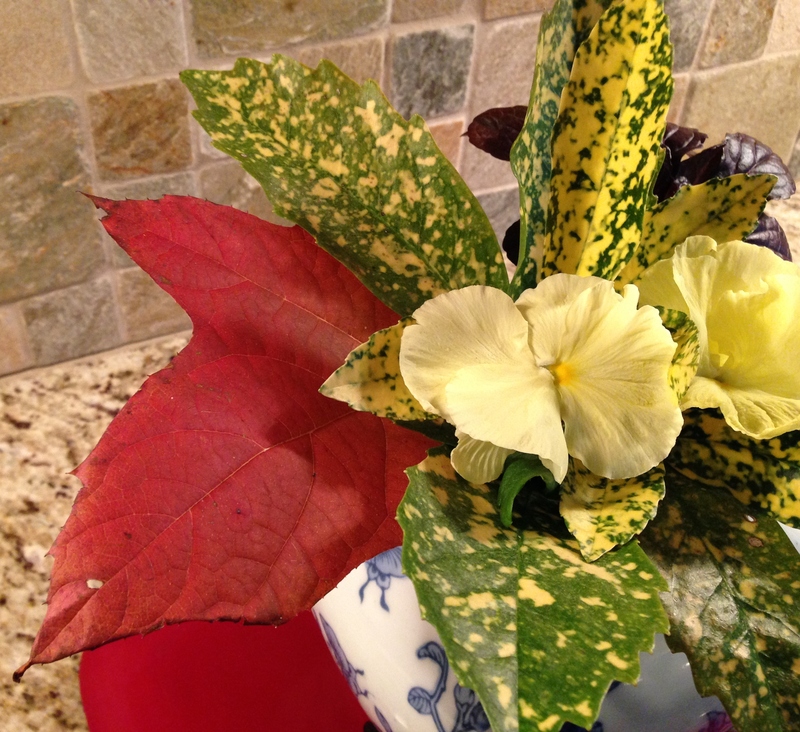 Surrounding a dash of yellow from a pair of pansies is one of the last leaves from an oak leaf hydrangea and foliage from Aucuba japonica ‘Mr. 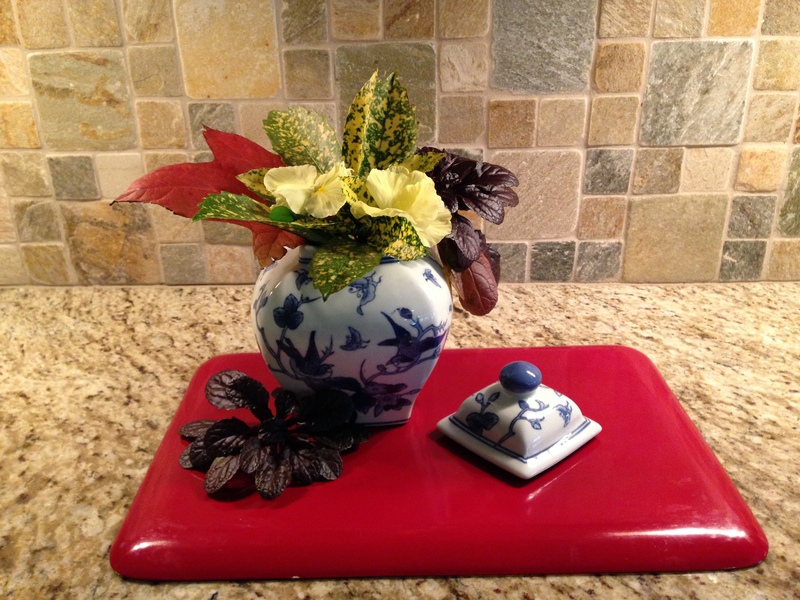 Goldstrike’ and Ajuga reptans ‘Mahogany.’ The vase is one of several blue and white ones that my Arranger very graciously allows me use from time to time. I am grateful once again for the creative assistance of my Arranger, who this time suggested that we turn the lacquer tray over to show the red bottom as the base for the arrangement. I suspect we may see it again. Please visit In a Vase on Monday to follow Cathy’s delightful postings at Rambling in the Garden. 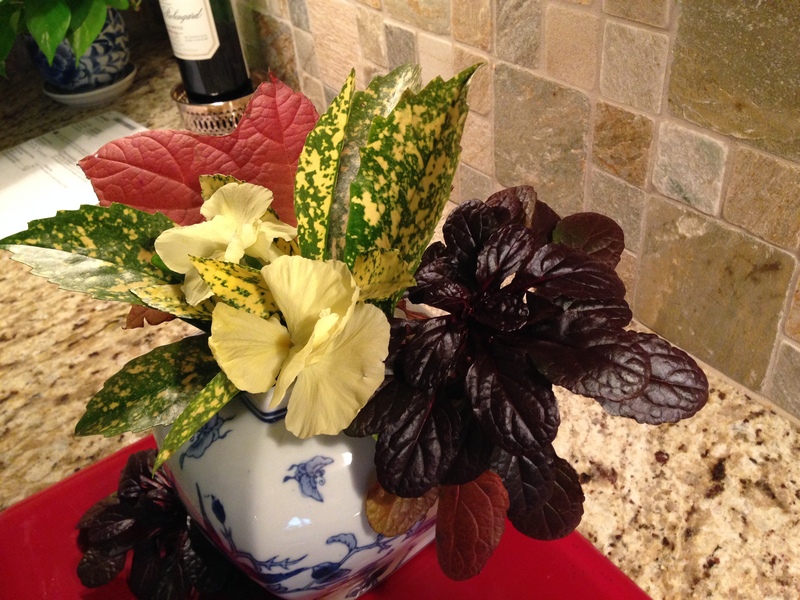 This entry was posted in Gardening, In a Vase on Monday and tagged ajuga, Ajuga reptans, Ajuga reptans Mahogany, Aucuba japonica, Aucuba japonica 'Mr. Goldstrike', blue and white vase, Cathy, flowers in my garden, foliage, In a Vase on Monday, oak leaf hydrangea, pansy, Rambling in the Garden, Vase. Bookmark the permalink. Your arranger is so clever-LOVE the red base to show off an arrangement. 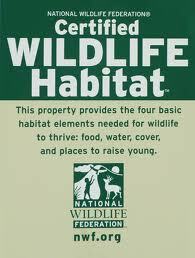 Yes, please, use it again. Thanks, Stepheny. She has so many good ideas…keeps me hopping. I think you did mighty fine for slim pickins. When I look out my window all I see is brown leaves! Thank you, Marian. Except for a few oaks that still have leaves, all I see are branches. The red base of the tray perfectly sets off your foliage and flowers today. We will all be using ‘just’ foliage very soon, your arrangement is very pretty, well done the arranger! Beautiful foliage colors and textures. They work well with each other and with the yellow pansies. Thank you, Susie. The pansies are about all that is left right now. Perhaps a camellia or two will open. Here’s hoping. Thanks, Brenda. I enjoy your poetry. Are you a professor? And thank you for your wonderful idea. John this is a stunning display and your arranger outdid themselves. I had not thought of using the Ajuga as mine stays green or purple even under the snow. Thanks, Donna. The ajuga is a bit tricky…to find one that has a good enough stem as well as the quality foliage is sometimes a challenge. I do hope to try some again. There are some lovely shades on the new ajuga cultivars. I love seeing pansies in arrangements John and that hydrangea leaf is such a fantastic colour – set off well by the upturned tray. Well done on another inspired vase!